The sections to the left of this page provide up to date details of the Councillors and their contact details, dates of Council meetings and agendas. Minutes and newsletters can also be downloaded. Check the news section for up to date news. The Parish Council exercises a wide range of "powers" and details of these functions and services are found in the Council Sites section. Procedures that the Council must adhere to is found in Policies/Procedures. 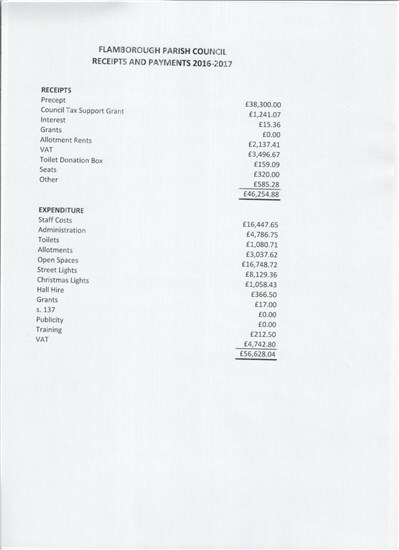 See Annual Reports of the Council to the right of this page along with accounts for the previous year and budget details for the current year. 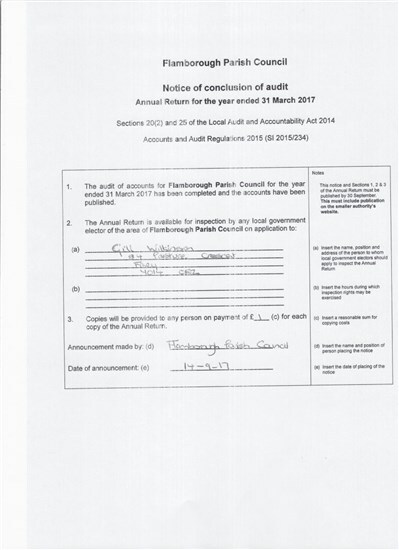 Flamborough Parish Council's records date back to 1895 when it was formed. Most of these records (which are extensive and varied) are kept at the East Riding of Yorkshire Archives at the Treasure House in Beverley and are open for members of the public to view by appointment. Records include minutes, committee minutes, attendance registers, finance, legal, royal coronations and jubilees, war memorial, waterworks, charities, commons registration, allotments, photographs, vestry minutes, overseer of poor, surveyor of highways, enclosure acts and general correspondence. 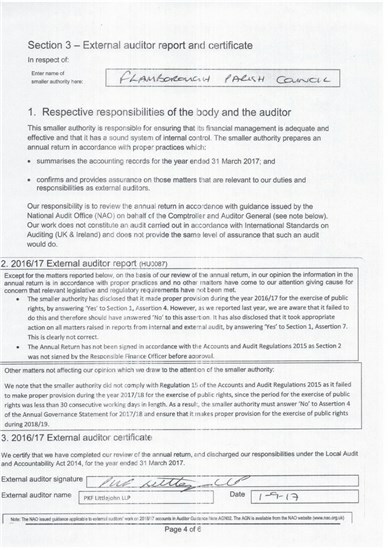 More recent records are held by the Clerk. Parish/Town Councils were first created as a result of the Local Government Act 1894 (Section 6) which transferred certain parish matters originally dealt with by the Church vestry to the Parish Council. More recently Parish Councils have been created under newer legislation (Local Government and Rating Act 1997) and further legislation in 2007 is expected to make this easier. The Parish Council is a statutory corporate body. It has a legal identity which is separate from its members and it can only act under "powers" or "duties" expressly conferred by legislation otherwise it is acting unlawfully. It must act reasonably within its powers. Most procedures of the Council are found in the Local Government Act 1972. "Powers" - are discretionary and a policy decision, for example, the Parish Council may provide seats and shelters in roads (Section 1, Parish Councils Act 1957). "Duties" - are mandatory and must be adhered to. These are quite often procedural, for example, three clear days notice of a meeting must be given. The Council is responsible for service delivery, setting the budget and precept and is accountable to the electorate of the community it serves. The Parish Council consists of the Chairman and no less than five Councillors who are elected every four years at the Ordinary Elections, unless there is a vacancy when it is filled either by by-election or co-option. Councillors must attend meetings, be prepared to make decisions and vote on difficult issues concerning the community and must adhere to the Code of Conduct. Councillors play a representative role in community leadership and liaison and act in the interests of the community. The Clerk is appointed and is accountable to the Council as a body, prepares agendas and takes Minutes of meetings, acts on the decisions of the Council and manages its affairs, ensuring the smooth, efficient, lawful running of Council business.